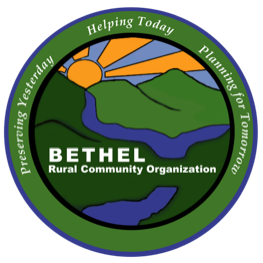 Bethel Rural Community Organization formed from the merger of two previous organizations: Bethel Community Organization (1991) and Pigeon Valley Citizens for Rural Preservation (2000). BRCO began operation in 2001. March 23, 2006 is the inception date for the organization's incorporation as a 501(c) 3 non-profit. BRCO's mission is to coordinate local and regional resources to perform programs and projects that enhance the quality of rural life in Bethel Community. BRCO Meetings are held the second Tuesday of every other month, beginning in January, at the BRCO community center. A pot-luck dinner begins at 6:30 p.m. followed by a speaker at 7 p.m. and a brief business meeting. All visitors are welcome. Bethel Rural Community Organization is a non-profit group whose focus allows members to create benevolence initiatives that include financial support for local citizens regarding dental and vision needs, children in transition, Christmas funds for children in need, utilities support for indigent citizens, funding for flood victims and families who have lost everything to house fires. A food pantry ensures food security for local citizens on an ongoing basis. BRCO’s educational outreach includes an annual scholarship as well as six programs yearly that serve to enlighten citizens concerning topics of importance. The organization donates annually to two local fire departments as well as the Haywood County Sheriff’s Department’s Cops for Kids program, Buy Haywood, Haywood Waterways Association, and Preservation NC. The Bethel Middle School track lighting is supported by BRCO as well as a citizenship award to a graduating eighth grader. Our historic preservation efforts have resulted in production of three DVDs and two CDs, eighteen historic art prints, and six books. BRCO’s rural preservation efforts are cutting-edge and recognized throughout the state, To date, we have placed 543 acres of land into permanent conservation easement along with 5,048 feet of river frontage and 15,436 feet of other stream footage. Two DVDs, one of which is distributed statewide, describe our rural conservation efforts. This organization, for its outstanding accomplishments, has received 3 state history awards from the NC Society of Historians, Western Carolina University’s prestigious Mountain Heritage Award, Haywood Waterway’s Pigeon River Award, and the top award in the region from WNC Communities for the past 5 years. BRCO also earned recognition as a historic site on the Blue Ridge National Heritage Area’s Heritage Trail as well as a site on the Haywood County Quilt Trail.